A few weeks ago, my colleagues began planning their trip to the NAEA conference. Now, I have never been to this conference, but I hear it's amazing! For those of you who are not art teachers, this is basically a crazy weekend conference packed with art educators across the nation. Two of my colleagues will be presenting this year and I unfortunately am unable to participate (due to my husband being across the world on business that same week). However, I really wanted to send a piece of me to the conference. I especially think (and hope) that I have the ideal audience at this conference in connection with the blog! 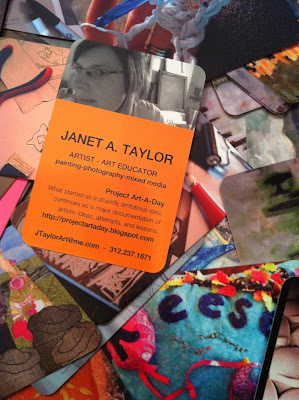 I saw a friend's business cards a few years ago that she purchased from Moo.com and LOVED them! They have great design options, you can design them yourself even, and you can a different image for each card if you want (which I do)! 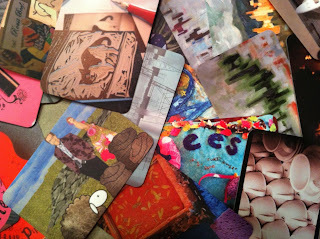 I spent a little time designing the cards, uploading photos, and committing to the slightly hefty price tag. In my opinion, they are very much worth it! Take a look at the PILE I have in this photo. One colleague related them to Artist Trading Cards since there is a different art project on each card. The card stock is quite heavy, and the sheen is a satin. It's almost hard to pass them out! This pile is an example of the "backs" of the cards. If you will be at the NAEA conference this year, keep an eye out for a few tables that will have my card, or my colleagues from Kenwood Academy who will have a stash on them as well.